There are many options available to you when you are looking for professional truck driving training so you can ultimately test and receive your professional truck driver license. 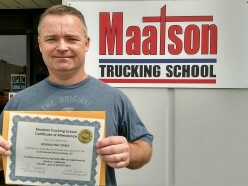 Maatson Trucking School provides hands-on training in “one-on-one” training environment. The training is conducted in company owned trucks for “future truck drivers” who obtain a valid permit – then we can begin your truck driver future with behind the wheel training in the “big rig” with one of our professional instructors. Manny Sarabia is the school’s Training Director and has been committed to the trucking business for over 30 years. Manny is a professional and licensed truck driver and has been educating and training “future truckers” for over 11 years. 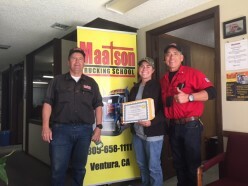 In the Ventura, CA area where Manny spent the last 11 years training, he has put hundreds of truck drivers on the road empowering them with the skills to become a professional truck driver. Manny’s list of references is happily shared!! Manny and his team ensure “future truckers” learn the safety skills as well as the driving skills to help you obtain your Commercial Driver’s License (CDL) from the California Department of Motor Vehicles (DMV). 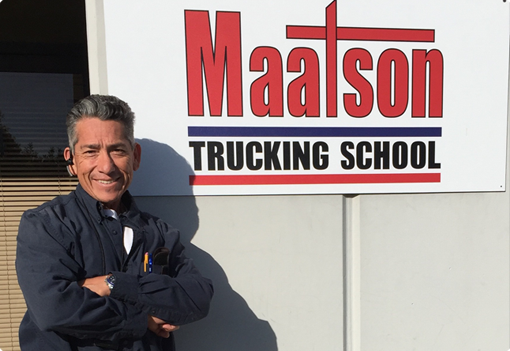 Why should you choose Maatson Trucking School? We design lesson programs that are customized to your needs and experience. You can schedule your lessons day, evenings and weekends providing flexibility for you. We offer bi-lingual training in Spanish. We offer hands on training behind the wheel of the truck – the “big rig”. We offer onsite evaluation to ensure you are ready to test with the DMV for your CDL. We are committed to quality driver education and have a proven track record with our team.